The S-Board is a neat clip-on front mudguard for road, cyclo-cross, or gravel bikes with a max. tyre width of 38 mm. 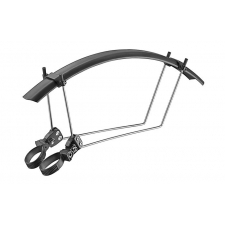 Its clever double hinged quick release fitting system also fits aero forks and is compatible with disc brakes. The S-Board includes adhesive protection kit to prevent paintwork damage. 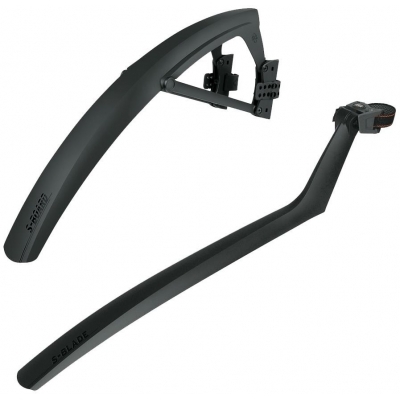 The rear S-Blade mudguard is the ideal companion to the S-Board. With its quick release fitting system, the S-Blade can be mounted around virtually any road bike seatpost and the angle can be optimally adjusted. Max tyre width 47mm. 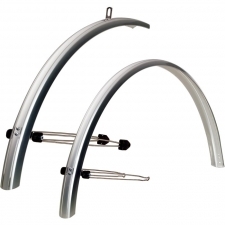 Buy your SKS S-Board & S-Blade Mudguard Set - Road and All-Road (max tyre width 38mm) from Revel Outdoors.